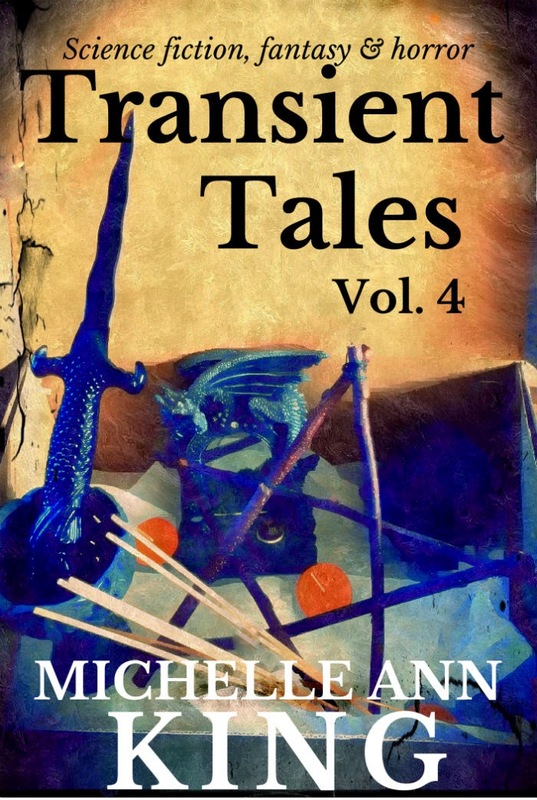 The fourth in the Transient Tales series collects 11 short stories of science fiction, fantasy and horror, totalling 20,000 words and ranging from light to dark and all shades in-between. Volume 4 features a life coach to the Gods, a ghost-disposal expert, a time gambler, a singing slug, a cunningly-disguised space teleport device, a girl who can eat anything, an inter-dimensional auction, a suburban demon infestation, a Garden of Eden where everyone can be God, a long-suffering Memory Transfer Manager, and a life-saving zombie. Congratulations on Your Apotheosis: Being an all-powerful superbeing might be better than working retail, but Sharon’s still bored. All she wants is an arch-enemy, so that they can fight an epic, eternal battle across space and time. Is that so much to ask? The Visiphorical Art: All of life is art and no one wants to die. Not even the ghosts. You Pay Your Money and You Take Your Chance: Some people (and insurance companies) think going into the Time Pocket is reckless, but maybe it’s worth the risk. Black Thumb: Debra thinks there’s nothing for a slug to feed on, in her blighted garden. She’s wrong. Out Shopping in Hyperspace: It seems like Mia’s the only one who recognises her father’s genius. But she’s not giving up. Jeanette's Feast: Gavin’s heard that cockroaches can survive anything. Maybe even his family. Free to Loving Home (Donation Required): Interdimensional travel can be time-consuming, physically debilitating and sometimes illegal, but the auctions at the Hugh Everett Rehoming Centre always make it worthwhile. Not the Pizza Girl: In the battle of man’s stomach versus his immortal soul, the stomach wins every time. Garden of Fog and Monsters: They pitch it to the volunteers as a contest that can be won, but there’s no such thing as a free paradise. Re: Corrections to Consciousness Module 14 (Memories: Age 41-60): Upgrade Ltd, and it’s Memory Transfer Managers, are very committed to making sure customer complaints are resolved, whatever it takes. The World Doesn't End, Even When it Should: Since the government won’t make zombies available on the NHS, Lucy will have to make her own arrangements.